Occupation: Ex-commander of Fire Valley. 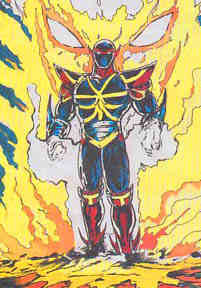 Powers/Abilities: Flying, fire blast, fire sword. History: Hega is one of the Fire Valley knights from 6000 years ago. During a war against the Red Empire his brothers were imprisoned in the Land of Thousand Darkness, and Hega was the only one able to escape. When the king of the Red Empire, Mega Yaksa, was to be awakened in the present day, it fell to Hega to stop him.